There is no Indian restaurant on Tate Street for the first time in decades. 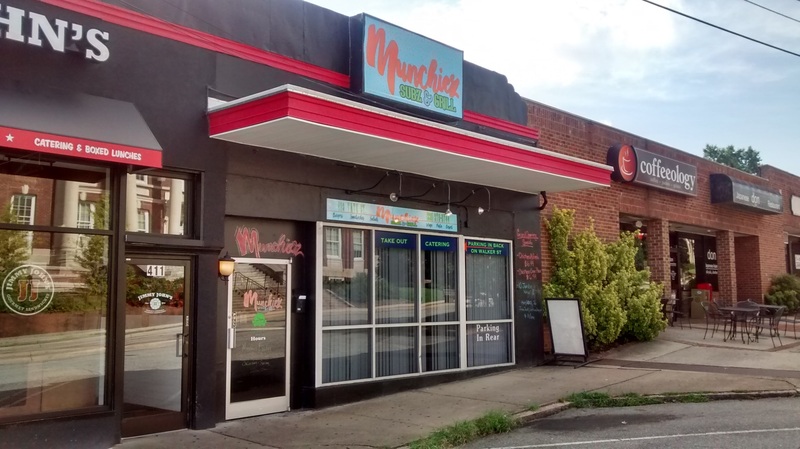 Cafe Mirchi has dropped its Indian-Pakistani menu and become a place called Munchiez Subz & Grill. Or possibly Munchiez Wingz & Grill, which is the name being used on the Facebook page that was Cafe Mirchi’s. “Hey this is our new business we have changed from Indian cuisine to subs and grill!” Taimoor Ahmed posted on the restaurant’s Google reviews page. The business reopened as Munchiez on August 5. It’s located between Jimmy John’s and Coffeeology on the east side of the street. The location at 413 South Tate has been an Indian restaurant under a series of owners since at least the early 90s. Cafe Mirchi opened last September, taking over from India Palace. The sub sandwich niche on Tate Street is, depending on your perspective, either robust or crowded. Subway has had a shop on Tate for more than 20 years, and Jimmy John’s has been there for 10 years or so. Manhattan Pizza and Subs and New York Pizza also have subs on their menus. UPDATE per Kate’s comment below: Slices also has subs. This entry was posted in Businesses, Tate Street and tagged Munchiez Subs and Grill. Bookmark the permalink. We have gathered too many sub places aaround here. guess that’s all the students want. I don’t eat there anymore. the pizza is not good; and the quality ofthe food is not up too par. It would be good if we could support the restaurants that try. There are still several very good Indian restaurants in Greensboro. Too bad they didn’t doi well on Tate St. The food is A BIT DIFFERENT; but good quality Indian food is more expensive and and requires a unique perspective! Lovit,myself. I tried the bar at “Cafe Mirchi” a couple of times at lunch and there seemed to be some quality control issues. Many of the items were not even warm and did not look very appealing. I took two co-workers with me and after looking at the items on the bar they wouldn’t even try it. They sat and drank a glass of tea. I was to polite not at least try the dishes. I really miss “Thai Garden”. I don’t frequent the existing “sub joints” and also had unpleasant experiences at my “two visits” to “Slices” (pizza didn’t seem to be cooked completely). I do eat at “Manhattan’s” occasionally. I work at UNCG and am always hoping for another good “lunch location”. Slices makes subs, too….. and Tate St. sure seems well-supplied with pizza places, too!